After exploring the delights of Rio, the culture of São Luís and the dream dunes of Lençóis Maranhenses, it’s time for Recife. Here you will find a mix of good restaurants, culture, history and beaches making it a perfect place to stop off for a few days and if you are lucky enough to be visiting at carnival time, be prepared to let loose and join in. Olinda. Photo by Valdiney Pimenta. A medieval style castle with immense gardens, outdoor sculptures and beautiful fountains which form the scenery created by Ricardo Brennand, a Pernambuco-born collector, and which plays host to items of priceless cultural value. Open from Tuesday to Sunday 1-5pm and costing approximately £5 per adult. If you like peace and quiet and don’t mind heading slightly further afield, make your way to Coroa do Aviao Beach which is set on an island. You can treat yourself to some delicious seafood and really relax. There’s also Porto de Galinhas which is about 65km away but has been awarded the title of the best beach in Brazil a number of times and so is worth a visit. If you prefer it a little less secluded, try Boa Viagem which is a long sandy beach so you can do a little bit of people watching in between soaking up the sun (but not so great for swimming due to the sharks!). The area is full of points of interest including Marco Zero Square and its panel “The compass rose” by Cicero Dias, the Park of Sculptures Francisco Brennand, buildings from the late 17th century and eclectic buildings from the early 20th century and much more. 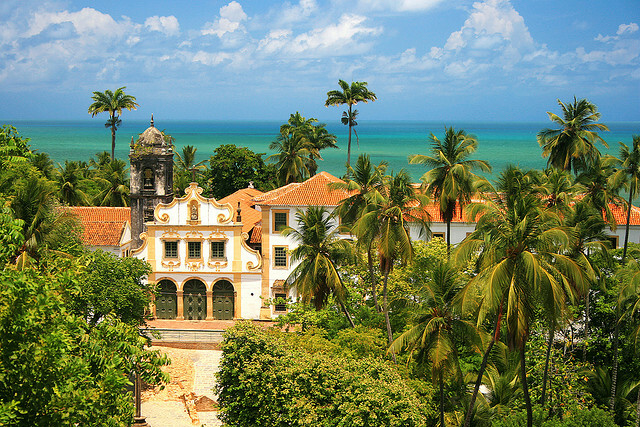 Declared a World Historical and Cultural Heritage by UNESCO in 1982, Olinda fascinates everyone not only for its architecture, but also for its natural beauty. Located just 6km away from Recife, this is a day trip must. Be dazzled by the Carmo Church, take a picture perfect snap of the brightly coloured historical houses and enjoy the tranquillity of the São Francisco Convent. For a spot on Boa Viagem beach, try Hotel Atlante Plaza. This hotel is all about location but also offers comfort. If you prefer to be immersed in culture, stay at the Pousada Villa Boa Vista for a good value and well located hotel. Whilst in Recife, there will be lots of different things to try. We recommend the fried needlefish, peixada, sun dried meat, cassava, sarapatel, bolo de rolo (a cake with very thin layers filled with guava paste), cocada (sweet coconut), negobom (sweet banana) as well as the fresh coconut water of course. From Sao Luis, it’s a 3 hour flight or if you decide to head here from Rio, it’s a 2.5 hour flight. With both options, it’s then a train journey from the airport into the centre which takes about half an hour. Think of Brazil and you’re probably thinking Sugarloaf Mountain, carnival, the favela and the World Cup but there is far more to Brazil than you think. Occupying almost 48% of South America and bordering every other South American country but for Ecuador and Chile, Brazil gives you a lot of ground to cover and varying experiences along the way. São Luís is the capital and largest city of the Brazilian state of Maranhão. It sits in the North East of Brazil on an island surround by pretty beaches (although avoid the sea) and has two main areas, the old town and the new town. In 1997, the historical centre was granted UNESCO World Heritage Status and brings together approximately three and a half thousand buildings dating from the 17th to 19th centuries. With a number of diverse cultural events such as the Bumba-Meu-Boi, Tambor-De-Crioula and Divine Holy Spirit festivals, as well as the famous carnival, it’s certainly a place of history and culture you will want to explore. 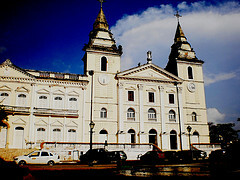 Igreja da Sé. Photo by renataaraujoo. The official residence and headquarters of the Maranhão Government, it is almost 400 years old, housing artistic treasures and relics that deserve to be seen and appreciated; it is named for the bronze lions that guard the entrance. Hotel Luzeiros São Luis is located in a nice area, overlooks the beach and is very comfortable for a few days whilst you explore the surrounding area. For a quaint guest house try Casa Lavinia which is very centrally located and is in a colonial style so you can feel part of São Luís whilst you explore its history. If there is a large group visiting, the Old Colonial Townhouse is perfect. Sleeping 20, it’s located in the centre and comes with a pool. Try the traditional dish of arroz-de-cuxá which is a rice based dish served with cuxá, a dish made from a slightly bitter vegetable called vinagreira, shrimp and various seasonings. Wash this down with Guaraná Jesus (a sweet pink soda with some guaraná extract and a clover and cinnamon flavour). São Luís is 3 hours from Brasilia and 4 hours from São Paulo (by plane). The closest point of international arrival is the city of Fortaleza in Ceará. The rainy season falls mainly from January to June and temperatures throughout the year are mild averaging 26 degrees.